Few have rejected the appeal of the story, written in a feverish, consistently thrilling fashion by Suzanne Collins, who also co-wrote this movie adaptation’s screenplay. 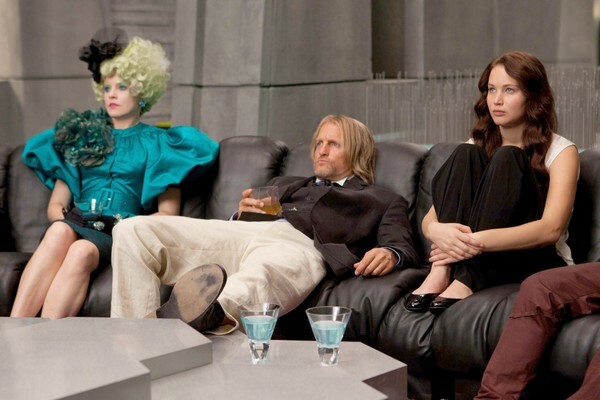 Because we are inside Katniss’ frantic, spunky head throughout the book, there is hardly a dull moment. This is the biggest mistake the movie makes, placing us at an often cold distance and having us be spectators along with the audience. Director Gary Ross insists on propelling the plot forward just as quickly as the book, ripping Katniss away from her family and friends after only 10 minutes of the movie. This also lacks a uniform vision that was in the book; the high-end glamor of the capital should be vastly different from the poverty of District 12 and the woods of the Games, but it also appears to be directed and art directed by completely different people. Katniss is apparently supposed to be scarred by the sudden change, but the way Jennifer Lawrence comes across, she couldn’t care about much of anything most of the time. Aside from colorful supporting performances from Elizabeth Banks, Stanley Tucci and Woody Harrelson, the acting is either uninspired or, in the case of the other tributes, awful. The Hunger Games doesn’t really work as a movie, which isn’t to say its horrible but just fundamentally flawed from the beginning. Failing to have a relatable character to take us inside the barbaric ritual turns it into a watered down version of the cult classic Battle Royale. The fighting in that movie is decidedly more barbaric, though Ross still makes you feel much of the brutality by knowing when to cut to stretch the bounds of the PG-13 rating constraint. Katniss running, diving and shooting her bow is the most endearing thing about the film adaptation, though. There is a mild love interest with the other male tribute, Peeta, but the script thankfully seems to roll its eyes and speed through it and the aftermath of the games. Despite that rushing, it still clocks in at almost two-and-a-half hours. It’s not a punishing duration because it isn’t mind-numbly dull and the themes remain somewhat in tact, but it feels thrown together and edited into mediocrity. Lawrence and Hutcherson are both capable actors (see Winter’s Bone and The Kids Are All Right, respectively), who are either too intimidated to get into it, or left their good performances on the cutting room floor. Collins penned an interesting if not revolutionary young teen read that, thanks to an interesting heroine, became somewhat of a sensation. The studio should’ve called David Fincher. This entry was posted in Reviews and tagged 2012 movies, Battle Royale, David Fincher, Elizabeth Banks, Gary Ross, Jennifer Lawrence, Josh Hutcherson, Katniss Everdeen, Sci-Fi Films, Suzanne Collins, The Hunger Games, Woody Harrelson by matterspamer. Bookmark the permalink. “Dystopia?” Did you learn that term while reading The Giver by Lois Lowry in 7th grade? That is the most similar teen novel to Hunger Games in the last 20 years. I think that’s where the term first came up, haha. And they are pretty similar, though Hunger Games is a bit more violent. I was more curious whether reading The Giver in 7th grade was the first time you had heard of the terms utopia and dystopia. I’ve read (and watched) the Hunger Games series and The Giver, of course. The violence factor is what draws more kids into Hunger Games. In The Giver there is much less violence except for the baby that is euthanized. I also agreed with your comment that the movie missed out by not focusing on the first person perspective. My 16 year old daughter noticed that as well. Without hearing Katniss’s thoughts, we don’t grow as attached to her character. I’m thinking about sharing your article on Hunger Games with my 7th grade class this week when they start their own Movie Critiques. I thought it would be cool to show them an example of them on the internet. I think it was 7th grade that I first heard the term. I remember having to define it on a test. I think I also remember it coming up a lot when I read 1984 in high school too. I can see either 1984 or Animal Farm. Of course there are plenty of utopia/dystopia movies today. The Island was okay.